ADDIS ABABA (Thomson Reuters Foundation) – On weekday mornings traffic on the road northeast from Jemo into the center of Addis Ababa grinds to a near standstill, as taxis, minibuses and tuk-tuks wrestle for space along the narrow arterial highway. Situated near the slopes of the hills that circle the Ethiopian capital’s southern flank, Jemo is a colossal condominium complex, completed in 2010 and comprising over 10,000 apartments. When it opened, Jemo was the largest such housing site in the city, and today is home to some 50,000 people, many of whom work several miles away in the city center. Sitting in a cafe on the ground floor of an apartment block on a leafy boulevard a few streets across from the highway, Tedros Worku gestures in the direction of the traffic. Like several of the men he sits with, Worku is unemployed. When he moved to Jemo four years ago, as a beneficiary of the Ethiopian government’s low-income housing scheme, the Integrated Housing Development Programme (IHDP), Worku planned to set up an informal business, as he had done when he lived in slum housing in the inner city. But when his friends in Jemo tried to set up a small street stall, the local authorities quickly shut them down. They were told that only formal businesses in the area’s expensive ground floor units were permitted. Despite waiting seven years to receive his single bedroom apartment in Jemo, Worku now plans to rent it out and use the income to move back to his old neighborhood. Worku’s predicament is one felt by many residents of the multi-storey housing units, known as condominiums, that have sprung up all across the city since the program was launched in 2005. As governments in much of the Western world have fallen out of love with top-down mass-housing schemes, the Ethiopian authorities have been rolling out what experts consider to be the largest social housing project in Africa, and one of the most ambitious in the developing world. “In Africa, there is nothing comparable in terms of numbers,” says William Cobbett of Cities Alliance. Addis Ababa’s skyline is now peppered with construction and from the sky, vast estates can be seen sprawling out from the edges of the city towards the wooded hills. In order to deal with rapid population growth and an acute shortage of affordable housing, authorities in Addis Ababa and in smaller cities across the country have been building condominium units targeting low and middle-income groups, financed entirely with public money. Although Ethiopia is one of the least urbanized countries in the world, Addis Ababa’s population is now thought to be close to four million, and growing at a rate of nearly four percent per year. The number of houses needed to meet supply is estimated to be as many as half a million. The new housing complexes are typically four storeys high, with the aim of promoting densification and containing the city’s urban sprawl. Poor residents like Worku, who do not own property and are instead reliant on insecure tenancies, are encouraged to register for a lottery system which allocates the units as they become available. Those who can afford the deposit and the scheme’s generous mortgage repayment terms are then granted ownership of their units, although all land in Ethiopia is still formally owned by the government. The aim is to transform a housing sector historically characterized by rental occupation into one based on private home ownership. 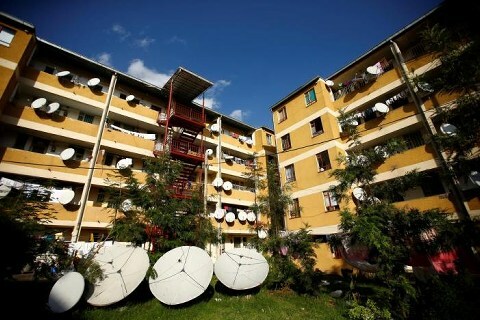 Under the previous communist regime, known as the Derg, approximately 60 percent of housing in Addis Ababa was rental accommodation and government-owned housing in the Kebele municipal divisions accounted for 93 percent of the sector. Kebele housing today is of typically poor quality, with homes made of wood and mud and without proper sanitation and infrastructure. According to a report produced for the World Bank in 2016, the IHDP marks a “radical departure” from previous approaches to housing in Ethiopia. The government aims to regenerate the inner city by replacing Kebele slums with condominiums. But many residents want to return to their Kebele homes. Emeret Tadese, a mother and housewife whose husband is a mechanic, now lives in Yeka Abado, a new condominium site on the eastern edge of Addis Ababa that is still under construction. The 200-acre (80.94 hectares) expanse will one day provide 18,000 apartments, according to authorities. But Tadese, like Worku, wants to move back to her kebele neighborhood in Piazza, the old Italian quarter of central Addis Ababa, although even with an income from rent the area would be too expensive today, she says. Some residents complain that they have been forced to downsize. Yehaulaishet Feleke, who sells eggs beneath her apartment in an inner city complex called Balderas, says that after four years waiting for a unit she was eventually given one that, though cleaner than her old home, is much smaller. In her kebele house she had three bedrooms, whereas now she has one, sleeping five people. “If I had a choice I would have stayed,” she says. Slum upgrading, rather than demolition and reconstruction, can be a more effective – and less disruptive – way of promoting urban development, experts say. But upgrading programs in Addis Ababa remain piecemeal and small scale, despite 80 percent of the city still consisting of informal settlements, according to a UN report published in 2010. However, many are impressed by the IHDP, despite its drawbacks. “For a country like Ethiopia, being able to complete more than 200,000 units between 2005 and 2015 is a huge achievement,” says Bisrat Kifle, a PhD student at the Ethiopian Institute of Architecture, Building Construction and City Development. The program has done a significant amount to address Ethiopia’s historically under-developed housing sector, he says. And teams from neighboring countries like Rwanda, Burundi and Tanzania are looking to Ethiopia to learn lessons, he notes. The real problem is that the IHDP has failed to target the city’s poorest effectively, he says. The 2016 report for the World Bank notes that the poorest cannot access the program because they struggle to afford the deposit. Moreover, the lottery system does not allocate according to need, although a new rule stipulating that 30 percent of new units must be allocated to women aims to address this by targeting poor, single mothers with little education. The UN also notes that many of the poorest beneficiaries are unable to service their mortgage repayments, and are forced to rent their units out and move to cheaper accommodation. Well-located complexes like Balderas are inhabited increasingly by reasonably well-off professionals, while peripheral sites tend to be populated by those on lower incomes. Gottera, also in central Addis Ababa, is known by locals as the “Facebook site” because it is popular with young graduates and professionals in the technology sector. There is a risk of “ghettoisation”, experts warn. However, admirers point out that the IHDP is about job creation as much as housing. The sight of independent metalworkers, bricklayers, and carpenters hard at work in the building sites of Yeka Abado is testament to the IHDP’s distinctiveness as an urban planning scheme. A study by the Cities Alliance in 2012 said it had created 176,000 jobs. “This is one of the successes of the program: to create housing with employment,” says Mekonnen Wube, an urban planner with the Addis Ababa Housing Development Project Office. The government says small businesses are also encouraged to set up and provide for the new estates. Mulgugeta Sherefa, a butcher and martial arts instructor in his early twenties, rents a single-bedroom apartment in Jemo with his two brothers and sister for 3,000 birr ($135) a month so that he can work on the site. He is not yet registered for the scheme, but hopes one day to own an apartment nearby. Worku, sitting drinking coffee beside him, shakes his head. “In the old housing you could always find work,” he says. October 25, 2016 in Around the Globe. Barack Obama: How will Africa remember him? Is Africa on Donald Trump’s radar?